Remember how I told you that caramel and I are having a minute? Still true. But...it might be more than a minute. Perhaps an hour? Who am I kidding--I will love caramel FOREVAHHHH! And one day I was just going about my life, probably working or something, and I was overcome by the craving for a good dark chocolate salted caramel candy. And I was like "I should totally make some." So, at my first opportunity, I made my best friend: salted caramel sauce (nnnngggg it is SO GOOD). Then I made these (after first spooning some into my mouth). And do you know what my first thought upon eating one of these candies was? Anyway, once I decided that these were the bestest, I couldn't gobble them up fast enough! You have delicious dark chocolate (the higher quality the better!) 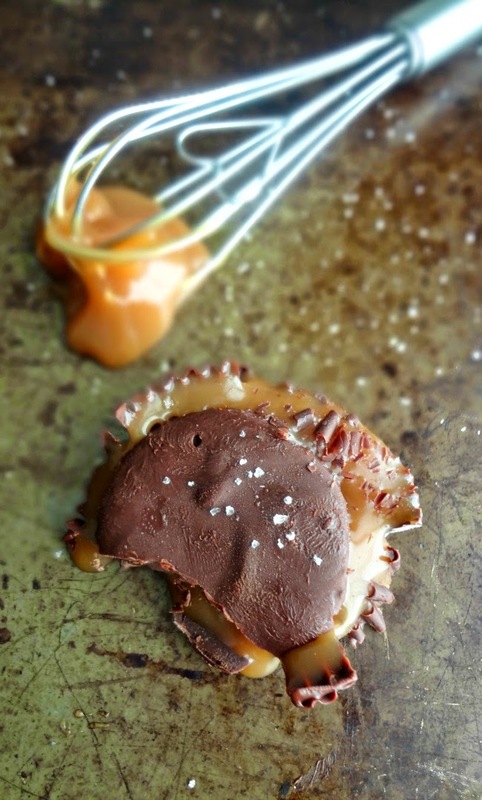 and once you bite into it you're rewarded with gooey, sweet and salty and delightfully rich caramel. Irresistible. For serious. And really...pretty easy to make. Everyone is pleased about this, methinks. Line a 24 cup mini muffin tin with paper liners. In a microwave safe bowl melt about 1 cup of the dark chocolate chips on high in 30 second increments-stirring after each-until melted and smooth. Drop about 1 teaspoon of chocolate into each liner, and use a small pastry brush to brush the chocolate evenly up the sides-making sure the bottom is still fully coated (add more chocolate if needed). Freeze for at least 20 minutes. 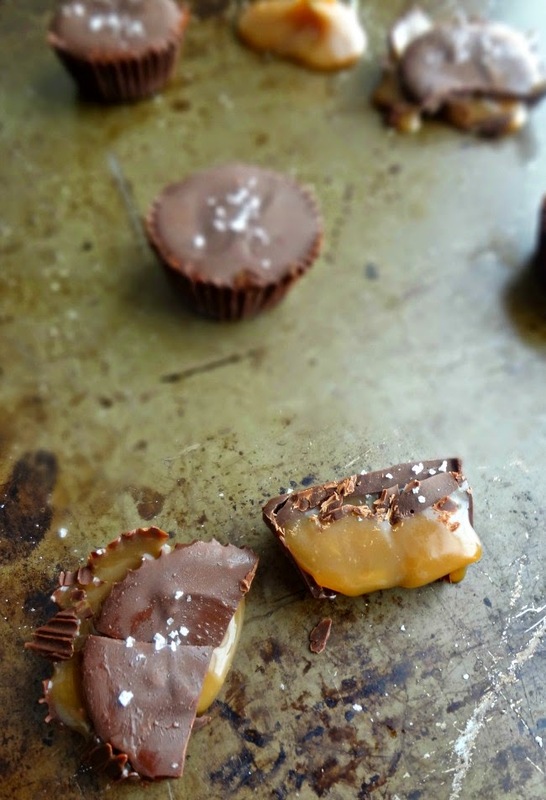 Take out the frozen chocolate cups and fill each with about 1 tbsp. 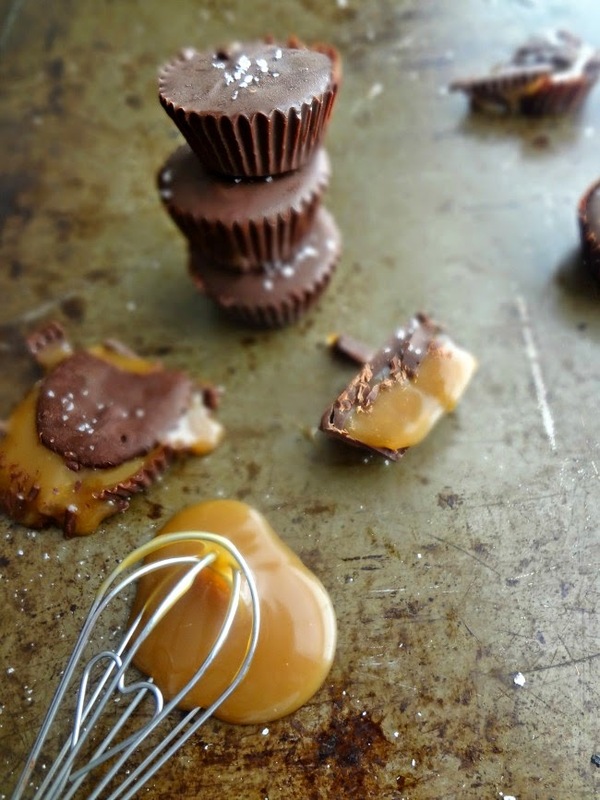 of chilled salted caramel sauce. Melt the rest of the chocolate chips in the same heatproof bowl on high in 30 second increments (again, stirring in between each) until fully melted. 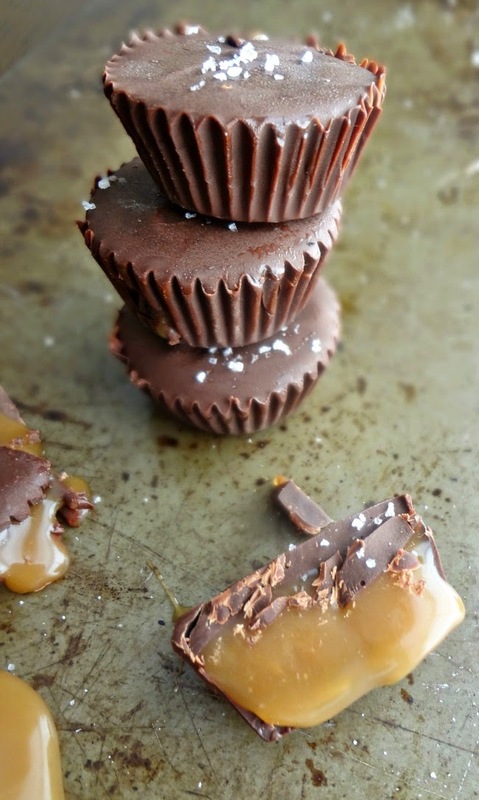 Drop enough chocolate onto the top of each caramel filled cup until it is covered. Freezer at least 25-30 more minutes. Sprinkle with sea salt and eat immediately! Or, store leftovers in the refrigerator. It is not recommended that these stay at room temperature for very long. 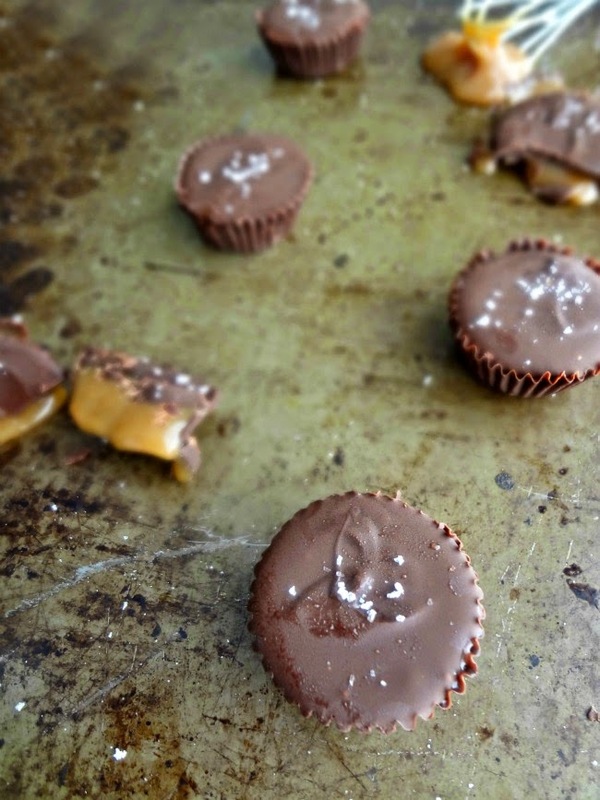 I could seriously die over the gooey caramel goodness right here.